Originally opened in 1927 as Hotel Georgia, the hotel combines the elegance of the roaring 1920s with sophisticated contemporary design. After a series of renovations this elegant Georgian retreat reopened as Rosewood Hotel Georgia, complete with 156 rooms and a fine dining experience at Chef David Hawksworth&apos;s namesake restaurant. The unique historic character of the hotel is retained in room palettes of light blue, ivory, and chocolate. This historic landmark partnered with Farmboy Fine Arts in 2009 to curate one of the largest privately-owned collections of Canadian contemporary fine art in North America, on display throughout the hotel for guests and local residents. Artists include Vancouver’s own Douglas Coupland and Sonny Assu, and Edmonton’s David Robinson. Skwachàys Lodge Aboriginal Hotel and Gallery | 29-31 West Pender St.
As Canada&apos;s first Aboriginal arts hotel, Skwachàys Lodge offers a one-of-a-kind arts and cultural experience. 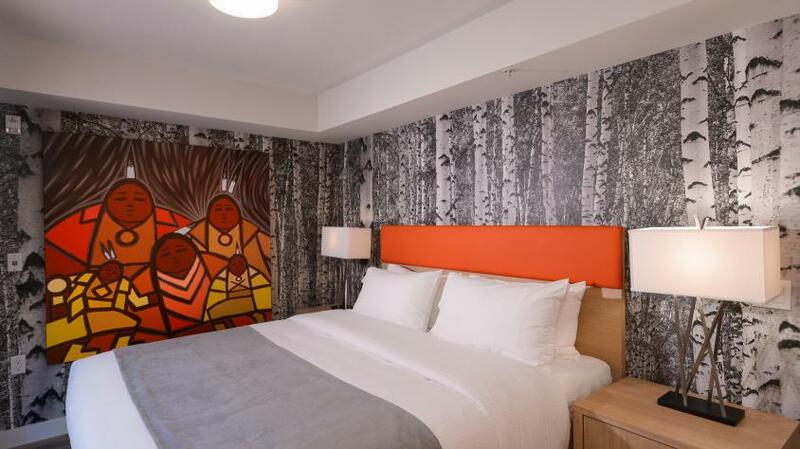 Designed by Aboriginal artists and Vancouver interior designers, the eighteen unique guest suites and gathering spaces offer visual journeys of First Nations culture and art. Located in Vancouver&apos;s Gastown neighbourhood, guests can visit the lodge&apos;s Aboriginal Art Gallery (featuring artists such as Alex Mountain, Cory Douglas, and Richard Shorty), or can take part in traditional Aboriginal smudging ceremonies, or visit a sweat lodge. The lodge also has an Artists in Residence program to promote practicing Indigenous artists. Opus Hotel | 322 Davie St. Adjacent to Vancouver&apos;s stunning False Creek in the Yaletown neighbourhood, this award-winning 96 room boutique hotel is not only pet friendly, but the rooms, spas, and even the La Pentola restaurant are bursting with colour and five lifestyle-inspired decor themes. Not only does the hotel strive to keep its guests "checked in" with the city&apos;s art scene, but actively participates in it. The hotel&apos;s local art program was born in 2013, and they have since celebrated the art of Tiko Kerr, Taizo Yamamoto, Mark Mizgala, and Jason Daussaul, among others. One of the most recent additions was an external wall mural, "Love Me" by Cathy High, to celebrate the hotel&apos;s 15th anniversary. The Listel | 1300 Robson St. Located in the heart of Vancouver&apos;s downtown core, The Listel is dedicated to environmental sustainability and promoting original artwork by a diverse group of artists. Each floor has a special theme: the Museum Floor rooms celebrate all things British Columbia in partnership with the University of British Columbia&apos;s Museum of Anthropology; the Gallery Floor rooms were designed as individual galleries, featuring limited edition works by international and national artists alike; the Artist Series Suites are deluxe suites designed to feature individual artists and design movements—Otto Rogers to Bernard Gantner, Art Deco to Neoclassical styles. Dubbed "Vancouver&apos;s most art-full hotel" by art critic Robin Laurence, the Listel&apos;s collection is not one to miss.